The Running Librarian: Google plus or minus? 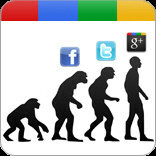 Unless you've been living under a rock for the last month you cant help but have noticed that Google have rolled out yet another social networking platform. Google plus (+) yes that really is the name of the product follows in the wake of Google Buzz and Google Wave. So is Google + any good? well it certainly has something to offer. I haven't quite discovered what yet although one person on Google + has said "It's all about the circles and the public posts, Google + is the best bits of Twitter crossed with Facebook"
I do think being able to seperate your friends, family, colleagues and other people you know into different "circles" is fantastic and certainly something that Facebook should look at doing. The site also looks a lot like Facebook which is going to appeal to a lot of people who already use Facebook. However I'm not sure Google + offers enough in terms of functionality to make it my first port of call each day. Only time will tell I guess. In the meantime why not have a read of one of the many blog posts that have been written about Google +. Google plus should you and your Library be there? What I would say is that you should definitely sign up for Google plus, add some people to circles and see what you make of the site. Before I joined I review the presentation below, this provides a very good introduction to circles, which are at the heart of Google plus. This entry was posted on Tuesday, 26 July 2011 at 11:40 and is filed under G+, Google, Google +, Google plus. You can follow any responses to this entry through the RSS 2.0. You can leave a response.